Payment companies expanding into traditional banking products is becoming a defining trend of the current international payments market. Moneycorp is a literal bank, Transferwise, EasyFX and WorldFirst are offering multicurrency accounts, and a slew of challengers are lining up to tackle payment cards and travel money. This makes sense – these products allow payment companies to expand their product set, develop deeper relationships with their clients, and gain insight into their customers overall financial product use. For payment companies building brands, the offering of a broader product set increases the potential return on the brand equity being built. Below we’ve highlighted the traditional banking products some of the main challengers are looking to tackle – and banks will need to defend. 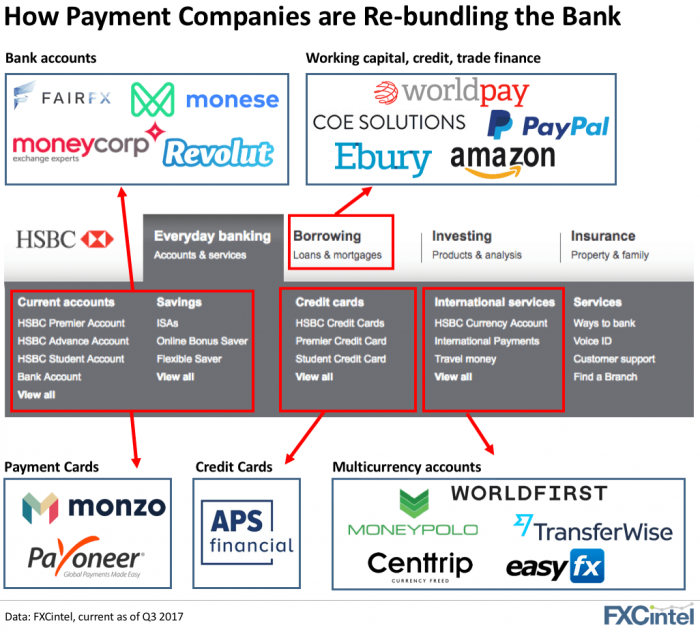 Our chart shows the different paths these payment companies are taking. The current account, long the safe haven of the bank, is clearly up for grabs. Open banking is pushing for transparency and ease of switching, which means banks can no longer count on owning the customer relationship from the start. If customers can get multi-currency accounts, working capital, and payment cards outside their bank – they may not see the need for a traditional account at all. Want to learn more about what areas payment companies are targeting, and how customers are responding? Get in touch with us. As challenger payment companies encroach on traditional banking products, some banks have responded not through direct competition but instead by partnering with those challengers. We recently worked with Bank of Ireland to provide the data and intelligence to support the launch of their new Bank of Ireland Global Payments service in the US – a joint initiative with WorldFirst. A perfect example of a bank partnering with a fintech company.